Start Miracle Software, list of companies those which are existing will be displayed. Press F3 or click on the Add button which opens the screen to create new company. Enter all the details like company number, state, name etc. All the details of company address are to be entered in 'Address Details' and other details of company like CST, TIN and PAN number can be entered in 'Other Details' screen. It will display list of accounts, press Insert or click on the Add button, new screen will appear to create a New Account. Enter account name, group and give other details then press Enter or click on OK button, a new account will be created. Press F1 to get more information. create a new account. 2. Easy way to enter the opening balance of account is as follows. on selected account for opening balance entry. It will display list of products press Ansert or click on Add button, new screen appears to create a New Product. Enter the product name and give other details, press Enter or click on OK button, a new product will be created. F3 or click on Add button. 2 Easy way to enter opening stock of product is as follows. Press Enter" on selected product, the opening stock quantity of the product can be entered. Voucher type list will be displayed. Select the appropriate Voucher Type and press Enter. Use insert or click on Add button, to view the voucher entry screen. Select Bank Account and enter other necessary details for Cheque Book & Slip Book entry. Select Cash Account and enter the necessary details for Cash Receipt / Payment entry. Select Cash or Bank Account, Payment or Receipt then enter voucher entry details like Date, Voucher No., or Cheque No., Account name and Amount. Note : 1 Press F3 to change from Payment to Receipt or Receipt to Payment. 2 Press FA to change Cash and Bank account. 4 Press F2 to enter date range. Option: Transaction => Sales Entry Sales Invoice Enter Sales invoice list will be displayed. In this list press Inert or click on Add button to enter Sales Entry (with stock/without stock). Enter/Add details like Cash/ Debit, Party name, Invoice type, Invoice date, Invoice no., Product details, Expense and VAT details. Press Enter" or click on Ok button to save the entry. Note: Expenses and VAT setting can be done by Setup - Sales Setup. For help, press F1 to get more information. Enter / Add details like Invoice No., Invoice date, Party and Sales account & Credit / Debit amount. Press Enter or click on Ok button to save sales Invoice entry. Follow the same procedure (as shown above of sales invoice) for purchase invoice entry. List of accounts will be displayed. Press Enter on the account name to get all the transaction detail of that specific account. Press Ctrl + P to get different types of vertical and horizontal reports. Cash Book will be displayed. Press types of reports. Day Book will be displayed. Here Press Ft to display different voucher type then Press Enter" to select voucher type. In above report, 1. Press Enter to change/edit the voucher. 2. Press Seart to Add new voucher. 3. Press Ctrl + Y to delete voucher. 4. Press CET + F3 for report setup. 5. Press Ctrl + P to print different types of reports. Carl + F2 to select FIFO, Agewise outstanding report with grouping on city, area. For outstanding reports press C + p or Click on Print button. Collection letter is also available. Press Ctrl + A to get Outstanding Analysis report like Recovery Report, Payment Performance, Average/Monthly outstanding. In Setup -> Company Setup -> Advance Setup -> Bill to Bill Outstanding, press Enter to choose option "Yes "to active bill to bill outstanding facility. Different types of Sales / Purchase register format list will be displayed. Press Enter on selected format. VAT Summary Report: For different types of VAT Reports. VAT Form: To generate VAT Forms as per statutory requirements. VAT E-Return: To generate VAT E-Return. Get Product Ledger with quantity and amount, various report like Group / Category wise, City / Area wise Sale / Purchase and Stock Report also available. 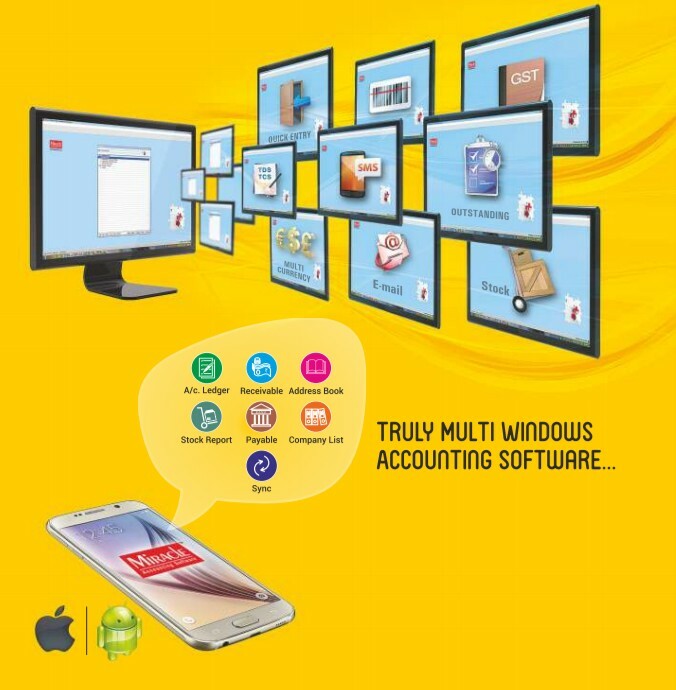 Final reports will be displayed, such as Trial Balance, Trading account, P&L A/c. and finally the Balance Sheet. Press Ctrl + F2 to get different types of report. Option : Report => Analysis Report Enter"
List of different types of Analysis Reports are available. In this report all types of analytical figures of the company like Gross Profit, Net Profit & Expense with percentage will be displayed. If previous year data is available then the figure of 3 years can be displayed together. In this report, Product / Category / Group wise Sale / Purchase amount / quantity with percentage and month wise summary report can be generated. In this report, party wise, city wise, area wise, along with percentage Sales / Purchase amount and month wise summary report can be generated. In this report, month wise account analysis and different types of group wise analysis report can be generated. TDS payable / TDS deducted by other reports are generated according to TDS details given at the time of creating account. After TDS Havala entry, TDS challan details can be entered and TDS certificate can be generated. Capital, Depreciation and Interest havala can be set by giving percentage and affected accounts. In above option, Capital, Interest, Depreciation havala entry can be done. Depreciation Chart, Interest report etc. are also available. New Financial Year (next or previous) can be created. Note : With the update balance option, all the closing balance can be carried forward to the next year. In Bank Account or Bank Book, If F6 is pressed then Asterisk Sign (*) occurs that means that entry will be reconciled. Bank reconciled balance is displayed at the bottom of screen. In bank reconciliation, if you enter a consile date then CC account's interest report will be available. Tab S sign will be appear before the entry and that means entry has been Audited. From this option we can get address book, phone book, label printing, reminder, mail merge, calendar and diary. In Account Ledger, Outstanding and Sale / Purchase Register, we can generate different types of Graph by pressing Curl + G.
Three type of securities are available in Miracle Software. 1. Software Password. 2. Company wise Password. 3. Userwise/Company wise Multi level security. Here you can define the user level. For more details/help use F1 . In Miracle software, when you are working in any option and you need help, just press F1 for context sensitive help. Tab can be used in any entry to move cursor forward. Shift + Tab can be used in any entry to move cursor back. In multiple entry like sales/purchase item entry or in journal entry after the appropriate selection to move the cursor out from the entry. In the same way to come out from popup list Tab is used. and that entry will be saved. If you want to give stored narration for any voucher entry that can be done by Shift + F1, narration list will be displayed. Press Enter to select the appropriate narration. Press Ctrl+R, to repeat narration of previous entry. Press Ctrl + Y, In multiple entries like Purchase / Sale entry and Journal entry, with this key the selected entry can be deleted. Press Shift + F12, you can get dialog box to find/search anything in any list/popup. Press Shift + F11, to find particular thing repeatedly after using above option (Shift+F12).